Shopping around for cabinetry, whether you’re building a new home or remodeling, can be intimidating. With cabinetry being such a large part of a remodeling/building budget, some homeowner’s may think a good way to save some money is to visit a big box store for their cabinetry. Big Box stores like Menard’s and Lowes offer their services in a one-stop location that makes it easy for someone to inquire about cabinetry while also being able to shop around for many other home improvement items in one trip. 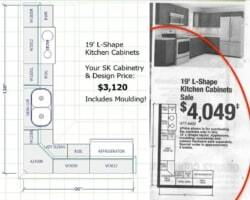 These stores also advertise big sales throughout the year, which is how we happened upon this ad (below) for one of these store’s cabinetry sales that also shows the cabinet configuration. To the left is our pricing vs. the advertisement in a paper we found. We put together the same layout, same wood species and stain, same cabinet construction and still came in under the advertised sale. Our pricing is based on our everyday pricing; no sales or promotions and includes our free design consultation and at-home measuring services, delivery, and (just for fun), we included crown moudling as well- which was not included in the advertised sale. So make sure to give your local small cabinetry suppliers a shot. They have extensive interior design backgrounds and will put thoughtfulness into your design while respecting your budget and delivering a great product.